Objective: In the following study the cucumber starch was extracted from cucumber fruit as a natural source. Then it was used as a binder in tablet formulated by wet granulation methods. Further, it was evaluated by different parameters to study its effect on the solubility and dissolution rate of a drug. Methods: The fruit of cucumber has high content of starch and hence it can be used as a material for the extraction of starch. Then the extracted starch was evaluated and used as a binder in different concentrations, in famotidine tablets. The tablets were formulated by wet granulation method by using 2% w/v, 4% w/v, 6% w/v and 8% w/v of cucumber starch. Then the formulated famotidine tablets were further evaluated for various parameters i.e. weight variation, hardness, friability, disintegration time and invitro drug release. Results: The starch obtained was qualitatively and quantitatively compared to known standard starch. The hardness and disintegration time of the tablets was found to be increased with increase in starch concentration. Tablets with highest binder concentration showed maximum hardness (6.4 kg) and disintegration time (8.5 min) and minimum friability (0.38%). After one hour, the tablets with 2% w/v starch showed maximum drug release (81.84%). Conclusion: The results from various evaluations show that cucumber starch has significant binding characteristics. Hence, it can be used as a tablet binder in pharmaceutical formulations. Keywords: Starch, binder, tablets, in-vitro dissolution, famotidine, binding properties. Keywords:Starch, binder, tablets, in-vitro dissolution, famotidine, binding properties. 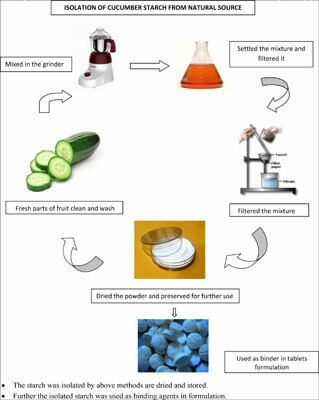 Abstract:Objective: In the following study the cucumber starch was extracted from cucumber fruit as a natural source. Then it was used as a binder in tablet formulated by wet granulation methods. Further, it was evaluated by different parameters to study its effect on the solubility and dissolution rate of a drug.